Prosthetic Valve; Anticoagulation After ICH Dr.Tahsin.N. 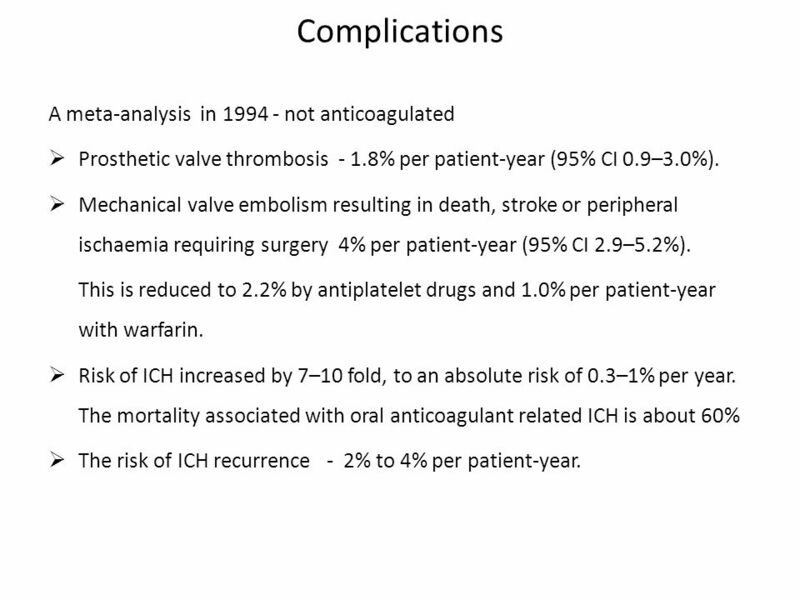 2 Complications A meta-analysis in 1994 - not anticoagulated  Prosthetic valve thrombosis - 1.8% per patient-year (95% CI 0.9–3.0%).  Mechanical valve embolism resulting in death, stroke or peripheral ischaemia requiring surgery 4% per patient-year (95% CI 2.9–5.2%). 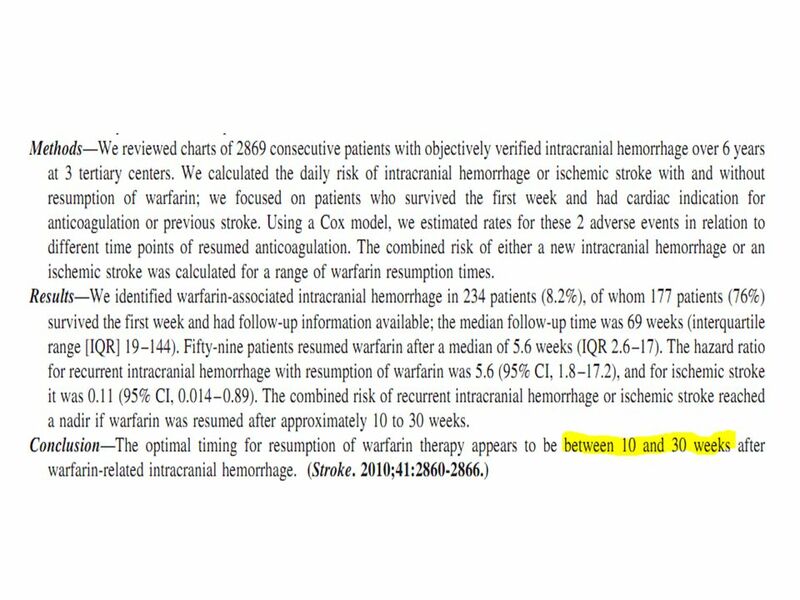 This is reduced to 2.2% by antiplatelet drugs and 1.0% per patient-year with warfarin.  Risk of ICH increased by 7–10 fold, to an absolute risk of 0.3–1% per year. 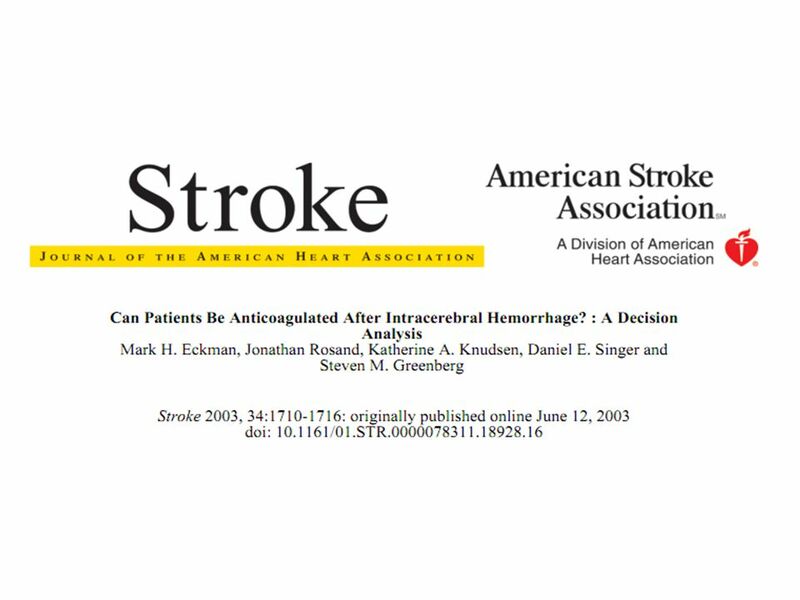 The mortality associated with oral anticoagulant related ICH is about 60%  The risk of ICH recurrence - 2% to 4% per patient-year. 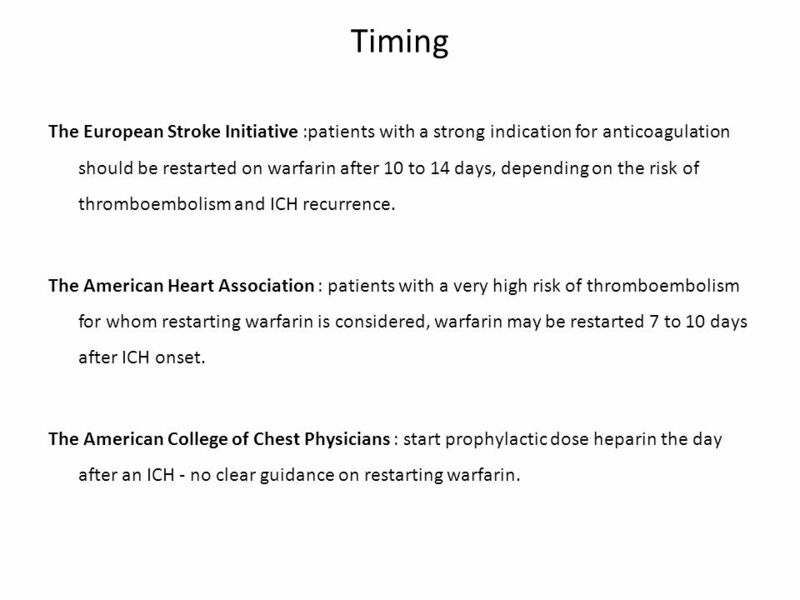 5 Timing The European Stroke Initiative :patients with a strong indication for anticoagulation should be restarted on warfarin after 10 to 14 days, depending on the risk of thromboembolism and ICH recurrence. 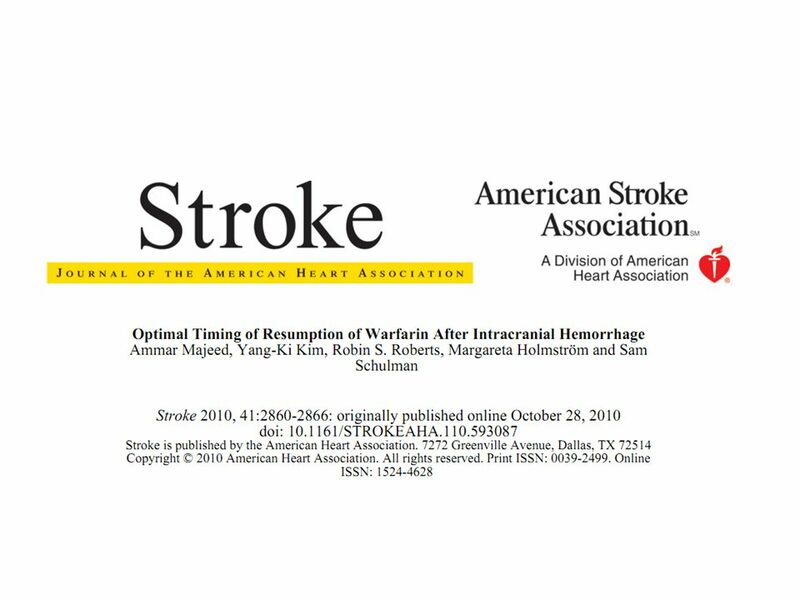 The American Heart Association : patients with a very high risk of thromboembolism for whom restarting warfarin is considered, warfarin may be restarted 7 to 10 days after ICH onset. 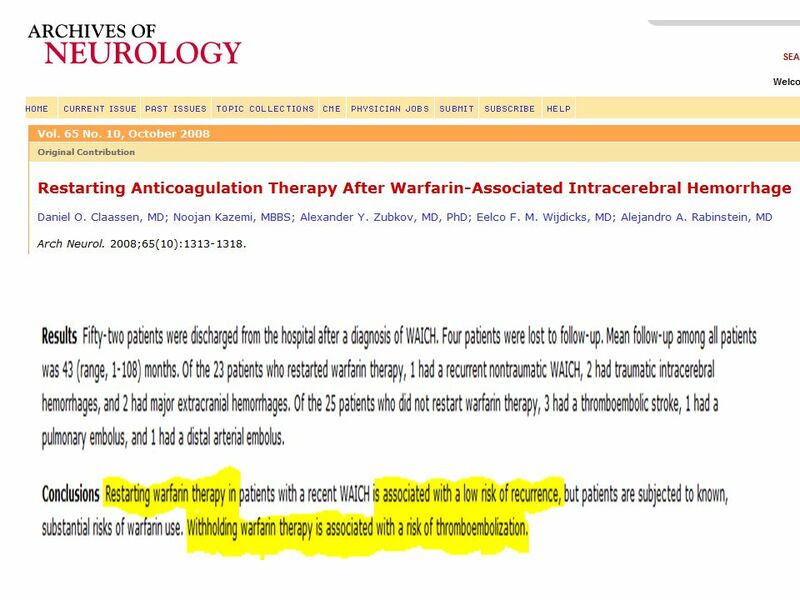 The American College of Chest Physicians : start prophylactic dose heparin the day after an ICH - no clear guidance on restarting warfarin. 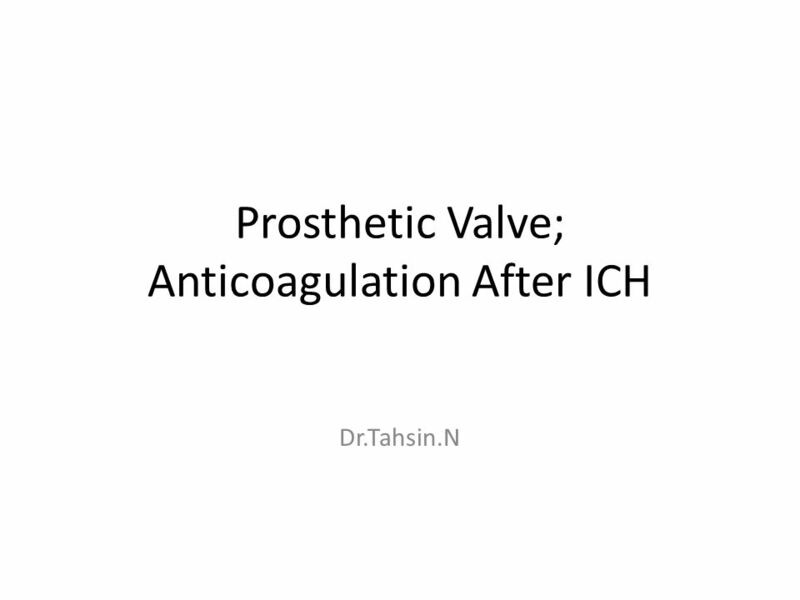 Download ppt "Prosthetic Valve; Anticoagulation After ICH Dr.Tahsin.N." Atrial Fibrillation Cardiovascular ISCEE 26th October 2010. JOURNAL REVIEW Newer Antithrombotics in AF 1 Dr Ranjith MP Senior Resident Department of Cardiology Government Medical college Kozhikode. Warfarin toxicity Presented by: Dr.Somaia Janah Presented by: Dr.Somaia Janah. Dr. Abdullah Ahmad Ghazi (R5) KSMC 8 May  TURP  gold standard in BPH  Using of A-Cog & A-Plt is increasing.  4% on A-Cog  37% on A-plt. STROKESTROKESTROKESTROKE. Why Change? Improve Mortality Improve Mortality Devastating and Life Altering Devastating and Life Altering Cost expense of. DURNER L.,BOURDOUMIS A., MASOOD J., BUCHHOLZ N. ROYAL LONDON HOSPITAL, BARTSHEALTH NHS TRUST ROYAL DEVON AND EXETER NHS TRUST HOMERTON UNIVERSITIY HOSPITAL. 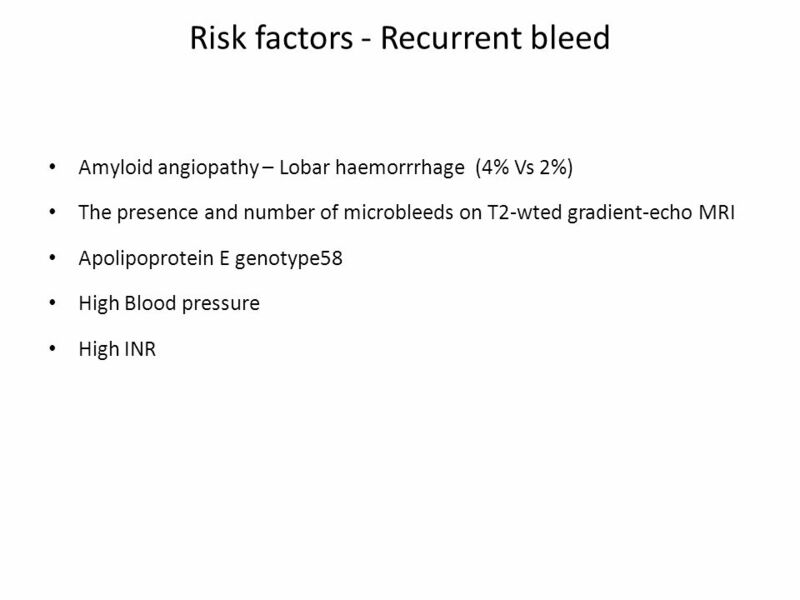 Medications that impact bleeding By Nino Lalaiants Inesa Legrian NYCCT 2012. 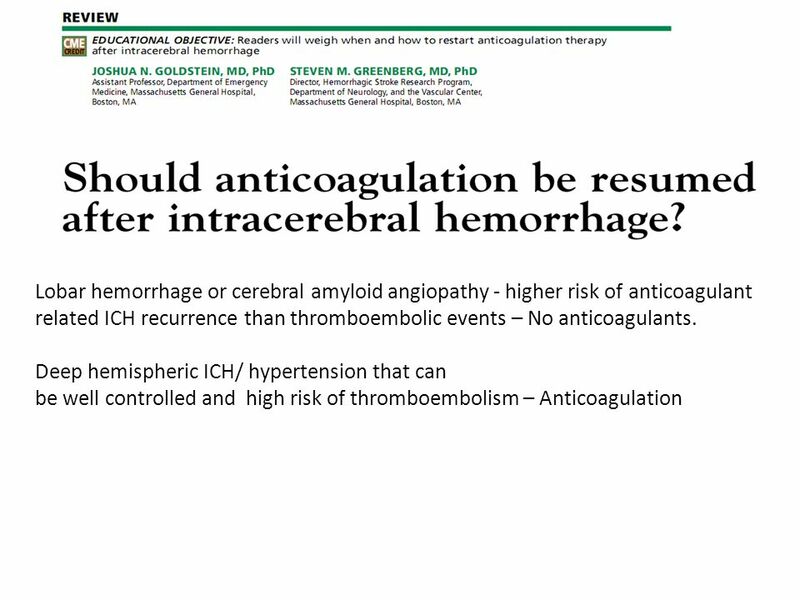 Anticoagulant in Ischemic Stroke : An Evidence based medicine approach. Anticoagulation? Antiplatelet? What’s the Score? 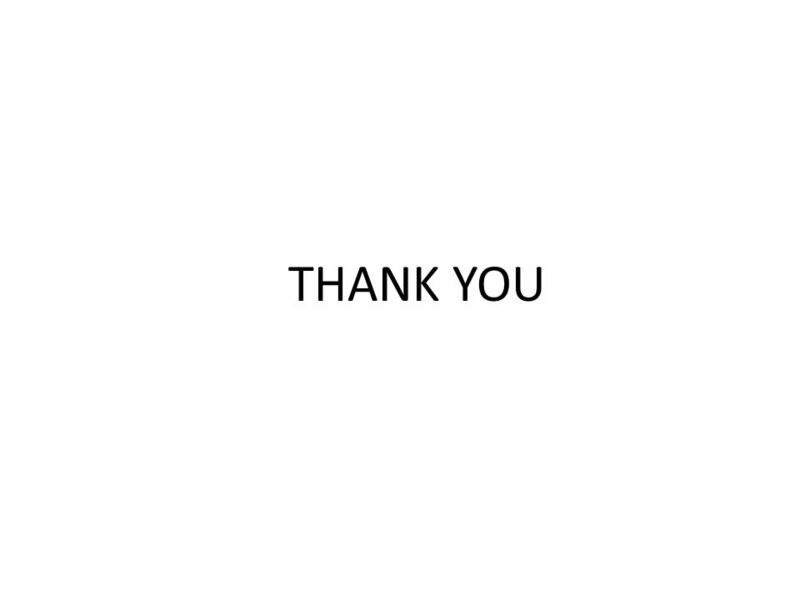 COPYRIGHT © 2015, ALL RIGHTS RESERVED From the Publishers of. Evidence That D-dimer Levels Predict Subsequent Thromboembolic and Cardiovascular Events in Patients with Atrial Fibrillation during Oral Anticoagulant. LIFEBLOOD THE Thrombosis CHARITY Venous thromboembolism – Treatment and secondary prevention Ulcus cruris Chronic PE PE DVT Post-thrombotic syndrome Death. Surgery with a Prosthetic Valve- What about the Warfarin? COPYRIGHT © 2014, ALL RIGHTS RESERVED From the Publishers of. Jim Hoehns, Pharm.D.. Edoxaban Oral factor Xa inhibitor Bioavailability: 62% Tmax: 1-2 hrs Elimination: 50% renal Half-life: 9-11 hours. 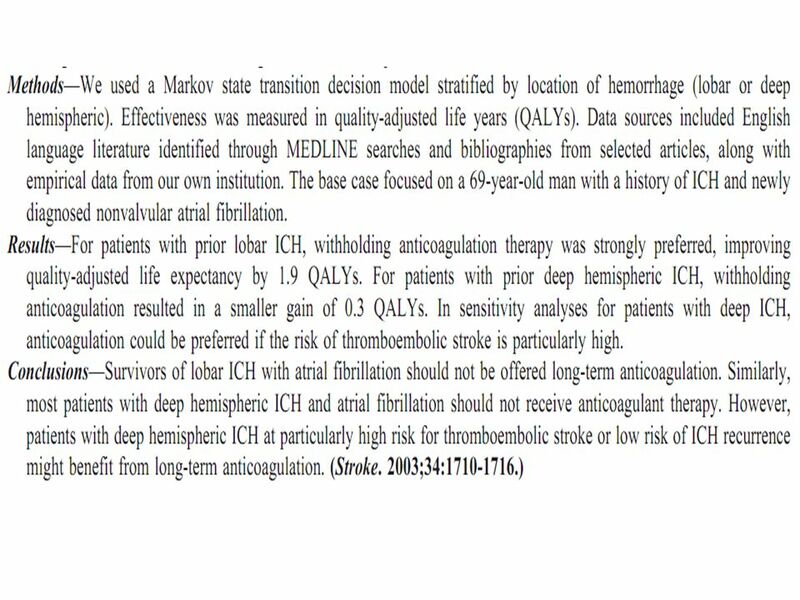 Review on NOACs Studies DR. KOUROSH SADEGHI TEHRAN UNIVERSITY OF MEDICAL SCIENCES.